My children love the book 'Gangsta Granny' by David Walliams, so much so that on World Book Day this year, my son Ben dressed up as the main character from the book complete with swag bag and walking stick! We were therefore delighted to learn that the Birmingham Stage Company – the acclaimed producers of Horrible Histories, George’s Marvellous Medicine and Tom’s Midnight Garden – are bringing their world premiere of David Walliams’ Gangsta Granny to the Opera House, Manchester, from Wednesday 7 June to Sunday 11 June 2017. 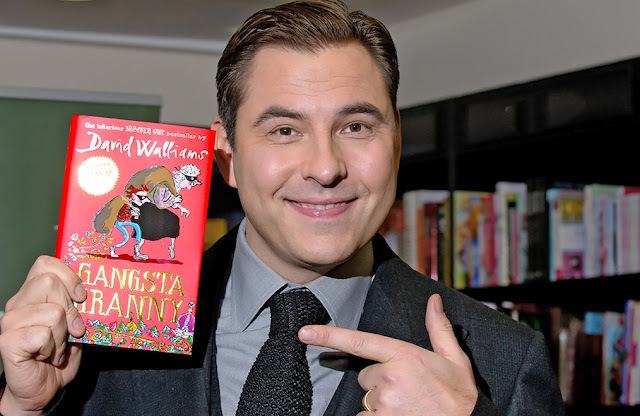 David Walliams is one of the judges on the popular Britain's Got Talent TV Show, and creator of the ground-breaking comedy series Little Britain and Big School. He is now also the best-selling author for children in the country. David began his publishing career at Harper Collins in early 2008 with his debut novel The Boy in the Dress. Then, after writing two other popular stories, in 2011 he published Gangsta Granny, which was shortlisted for both The Red House Children's Book Award and for the Roald Dahl Funny Prize. At Christmas 2013 a TV version of Gangsta Granny was shown on BBC One with an all-star cast including David Walliams himself. Gangsta Granny went straight to Number 1 in the childrens's book charts and his books have been translated into no fewer than 30 languages. Gangsta Granny is a must for all families as the show will be enjoyed by everyone aged from 5 to 105! It's both laugh out loud funny with some brilliant comic scenes but also has some very moving and truthful things to say about family relationships. Tickets can be booked now at www.atgtickets.com/Manchester or by calling the box office on 0844 871 3018. (Booking/transaction fee applies). Performances: Wednesday and Friday 10am and 7pm / Thursday 10am and 2pm / Saturday 10:30am and 2:30pm / Sunday 11am. We also have a family ticket (2 adults + 2 children) to give away to the show on Wednesday 7th June at 7pm at the Opera House Manchester. Tickets are non transferable and valid for the stated date only. If you would like to enter then please use the gleam app below. Good Luck! Win a Family Ticket to see Gangsta Granny! Terms & Conditions: Competition open to UK entrants only. No bulk/third party entries. There is 1 (one) prize of 1 (one) x family ticket (2 adults & 2 children) for the 7pm show on Wednesday 7th June 2017 at Opera House Manchester. The tickets are non transferable and are only valid for the date and time as stated. Competition closes on Friday 2nd June at midday. Due to the short time between the competition closing and the date of the show, the winner will have 24 hours to respond to the winning email before a new winner from the remaining eligible entries is drawn. Failure to respond to the winning email within 24 hours will result in the prize being forfeited and a new winner being chosen. The winners details shall be shared with the promoter for the purpose of prize fulfilment only. I loved him in Little Britain!